It’s official. With a starting price of less than £15,000, the new Toyota Yaris Hybrid will offer market-leading CO2 emissions of 79g/km, and fuel economy of 80.7mpg. The CO2 figure of just 79g/km delivers real running cost benefits for drivers. It means Yaris Hybrid qualifies for free road tax (VED) in the UK, and is exempt from the London congestion charge. For company car drivers, the record low CO2 emissions fall well within the lowest Benefit In Kind (BIK) taxation band of 10%. 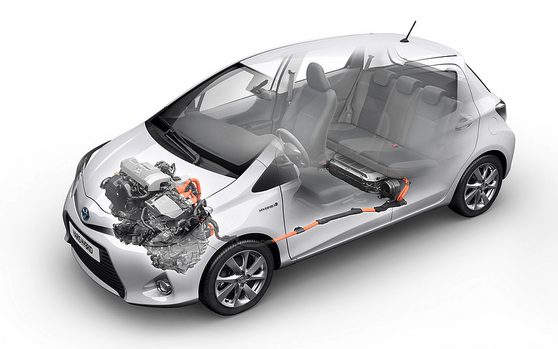 The new Yaris Hybrid shows Toyota doing what it does best, providing market-leading technology at an affordable price. Yaris Hybrid will be available in the UK for less than £15,000 on-the-road, making it the most reasonably priced hybrid on sale in the UK. The 99bhp Hybrid Synergy Drive powertrain (pictured below) offers a unique combination of economy and power in a small hatchback. And all this without requiring the customer to compromise on comfort features such as air-conditioning and automatic transmission, which are fitted to the car as standard – more details announced here. Part of the genius of the full hybrid system is minimising the time on any given journey when the petrol engine is running. These “zero-emission” periods can be as much as one third of a typical urban journey. Yaris Hybrid is the most CO2 efficient combustion engine vehicle in the mainstream market. As we announced earlier this month, Yaris Hybrid will debut at the 2012 Geneva motor show, alongside GT 86 and the FT-Bh and Toyota diji concepts. It is available for pre-order from Toyota Centres now, with customer deliveries from 1 July. Good to hear about your Yaris Hybrid. Under current legislation, vehicles below 100 g/km of CO2 are exempt from VED. (vehicle excise duty or road tax). At present you will not be paying VED on your Yaris after three years however this taxation is set by the Government and therefore can be subject to change. Toyota – Always a Better Way – I dont think so. What use is a puncture repair kit to a 73 year old woman, indeed what use at all, first you have to find the puncture etc etc. The puncture I had when going to my son’s silver wedding party could not have been repaired by ANY puncture repair kit, It would have meant calling out rescue, waiting and then being towed – where? this happened on a Sunday. Spare wheel – changed in fifteen minutes and on our way. This is a cost saving exercise and should never have been brought out in the first place. I like Toyota very much, but unless I can buy one with a spare wheel I shall be goung either to Volkswagon or Skoda who still provide these. Thank you for taking the time to write to us with your feedback regarding the tyre repair kit (TRK). We really appreciate customers taking the time to share their opinions and experiences. Most manufacturers have introduced TRK to some or even all of their range of cars but that’s not to say we shouldn’t listen and act upon customer feedback. As a result, our Product Development team are well aware of some opinions regarding TRK and are currently working to provide an alternative. Unfortunately, at this time, we are awaiting details regarding the proposed alternative. In the meantime, please click on the link and take a look at our short video on ‘How to use a Tyre Repair Kit’: http://ow.ly/kOQhH. While we don’t expect to change everyone’s minds about TRK, we have found this has helped explain why TRK is a credible solution and hopefully answers other questions you may have about puncture repairs. We hope this helps and thank you once again for your post. I really hope Toyota DO listen, as I know plenty of people who, like me, try to buy cars with full size spare wheel, never mind none at all! I too will switch to whichever ever manufactures continue to offer this choice, and if I was choosing between 2 similar cars and one had a full size spare, that’s what I’d go for, That was why our second car was an Aygo, not a Yaris. Why not design the boot so it’s possible to have a spare wheel as an optional extra? How hard can that be? Back in 2003, when I had an original Prius, I was mightily impressed when I and many other owners were invited by Toyota to preview then forthcoming Gen 2 Prius and give feedback. Almost everyone there said it MUST have a proper spare wheel, and two people even took the trays out of the boot and measured it to prove one would fit. We were then mighty UN-impressed when the car launched the next year with a space saver! One of the main reasons I never bought a Gen2. In recent years I’ve had four occasions when a tyre punctured so badly it would not have been suitable for a repair kit. Hi! I’ve been eyeing for the Yaris hybrid for a few months now, and I really want to purchase one when it comes out. But twice when I spoke to my local dealer (Bristol north), they still say they know NOTHING about the Yaris hybrid’s specs, price, release date, when they’ll have one in the showroom, etc. That makes me feel very frustrated (how can Toyota expect the customers to pre-order one if the staff don’t even know the basics like the specs and prices, etc??? I mean, even I can find them on the Internet) I wonder if all the dealers are like this (without given any information) or should I contact another dealer? Thanks for your post and sorry for your recent frustration. We like to offer our customers the opportunity to be among the first in the UK to order, and then receive our new cars. As such, the pre-ordered vehicles are often among the first to enter the country, along with our Centre’s vehicles too. We are expecting the first cars to be ready for customers around the beginning of July. At the same time, cars will be delivered to Centres. We’ve recently written about the New Yaris Hybrid in the following blog post, which you may find useful: http://ow.ly/aX3GF. We hope this is handy, please do get in touch should you have any questions and we’ll do our best to help! Do you know if the Yaris Hybrid will have heated mirrors please (better still, electric folding)? Thank you for your question and please accept my apologies for coming back to you late on this one. Heated wing mirrors will be available on the new Yaris Hybrid. Although they won’t have an option to retract electronically and automatically, they will come as standard on all models. It’s good that *finally* there will be heated mirrors – when I first had these nearly 30 years ago I never believed I’d drive a car again that didn’t have them. A shame Toyota didn’t do the whole hog with electric folding, many of my friends find it amusing to see me walking round my Toyota so often to put them in and out (a necessity in my narrow drive and the narrow lanes where I often park – even friends with quite old, basic Fiestas and Kias have them automatically fold in/out when they work them remote locking. I may yet buy the Honda Jazz Hybrid even though the system is nowhere near as clever, because I value the equipment levels too. At least the fact that it now has heated mirrors means I haven’t ruled the Yaris out, yet. We’ll be happy to help if you have any questions whilst making a decision. In the meantime, check out our Flickr set of the new Yaris Hybrid images: http://ow.ly/aE5ue. Otherwise, the contact information for our Centres can be found here: http://ow.ly/aE5xL. Many thanks. Will the Yaris Hybrid still have the solar panel on the roof, I understand these were originally to run the climate control requirements? I do not see any reference to this any more but it would be a grate shame if they are not fitted. Thank you for your question. The Yaris Hybrid is a brand new model for the Toyota range and it isn’t available with a solar roof, which you may have seen on some other Toyota models. Take a look through the Yaris Hybrid car chapter on our website for further details and full specification: http://ow.ly/aCSYG. We hope this helps, many thanks. Thank you for a very prompt reply. I saw the reference to the solar panel roof on your web site and indeed it is still there! If you follow the “Find out more” link under the chapter “Outsmart life with the new Yaris Hybrid” and scroll down to the Yaris Hybrid you will see that this says the solar roof is included. Clearly it was the original intention and as I say it is a shame that it will not be there. I agree, given they already offer this option on the Prius it should not have been too hard to add it to this model. I’ll be even more gutted if it doesn’t have heater door mirrors (what happened to the camera versions of the concept car?) [no answer from anyone on that yet, by the way – see below] – despite eagerly awaiting the original Mk1 Prius, when it was finally launched in late 2000 I delayed buying one for nearly 2 years because I wasn’t sure I wanted to live without heated mirrors (they had been common for over 15 years at that time!). When I did take the plunge, much as I loved driving the cars I often cursed Toyota when the mirrors and rear windows misted up on my early morning trips on the M1 from about late September to late March! Thank you for your reply. That section is specifically looking at the Yaris Hybrid Concept and, as you have noted, there are a few differences to the production car. It’s a good spot but may I refer you to the Yaris Hybrid chapter for the details of the production vehicle: http://ow.ly/aD1eE. For the full details of the car’s specification and also the dates to be expected at Darlington, please contact them on 01325 254 545. We anticipate our Centres to have a Yaris Hybrid available as of the beginning of July, however please confirm with them for specific dates. Hope this helps! Many thanks. I’d be interested to know if the Hybrid Yaris will have heated door mirrors, and whether they fold in electrically (preferably automatically folding/unfolding when the central locking is operated). What does ‘under £15,000’ mean? £14,999? This car should be priced around £13k to be competitive. It’s still too expensive – I just hope that dealers will be open to negotiation. the price of this little car is high and I wonder if it makes financial sense to most people. Also the interior of the new Yaris feels cheaply finished with a lot of hard textured plastic. It is nowhere near as nice as a VW Polo to sit in for example, which is a shame as the Yaris will almost certainly be the more reliable of the two. I ran a 2002 Mk1 Prius for 9 years and over 160,000 miles, and apart from excellent fuel economy, the Hybrid system meant other running costs were minimal: the original brake pads lasted 100,000 miles (only replaced then because the discs rusted! ), and spark plugs had only been replaced twice (then only because the book said every 60,000 miles – the ones they took out looked like new). No belts to wear out or break. Servicing was really cheap by today’s standards. Plus the serene driving experience was magic! I’m tempted to buy a Yaris Hybrid because the current Prius is just too big for my needs (and I hate the closed-in centre console that makes it impossible to get in from the passenger side when some-one’s parked too close to the driver’s door – a constant problem in London – that put me off the Auris Hybrid too). Will there be a model or option with cruise control? 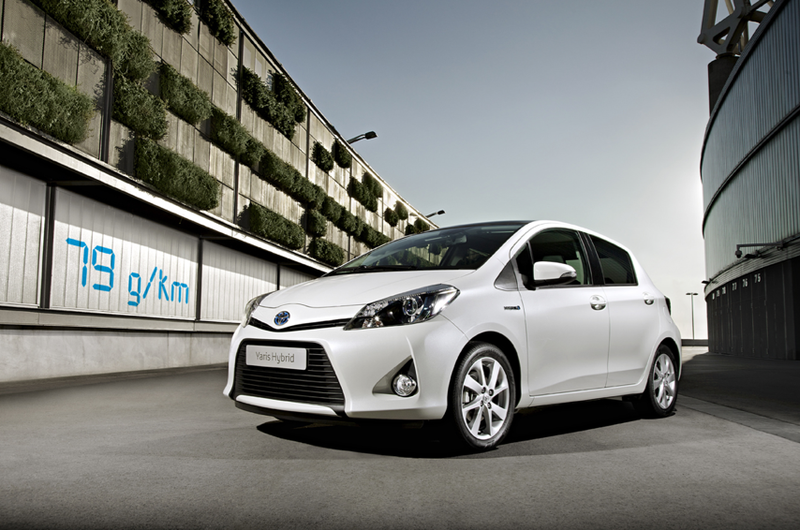 Full details of the Yaris Hybrid specification and price have been released, you can see it here at http://ow.ly/abdhN. The T-Spirit model will have cruise control as standard, I hope that helps answer your question. Apologies about the delay in coming back to on this matter. Shelling out £15k on anything could never be regarded as ‘cheap’, but it is certainly a competitive package. I am also pleased that CVT transmission is included and not that awful MMT. The key question for me is fuel consumption – how close will the car get to that 80mpg figure in real life driving? We shall see. Can you confirm this is 100% true, it seems quite cheap!! We can confirm that the Toyota Yaris Hybrid will be available in the UK with a starting price under £15,000. Thanks for your question.